Canadian Prime Minister Justin Trudeau and Canadian Defense Minister Harjit Sajjan arrive at the 2018 NATO Summit in Brussels, Belgium, on July 11, 2018. 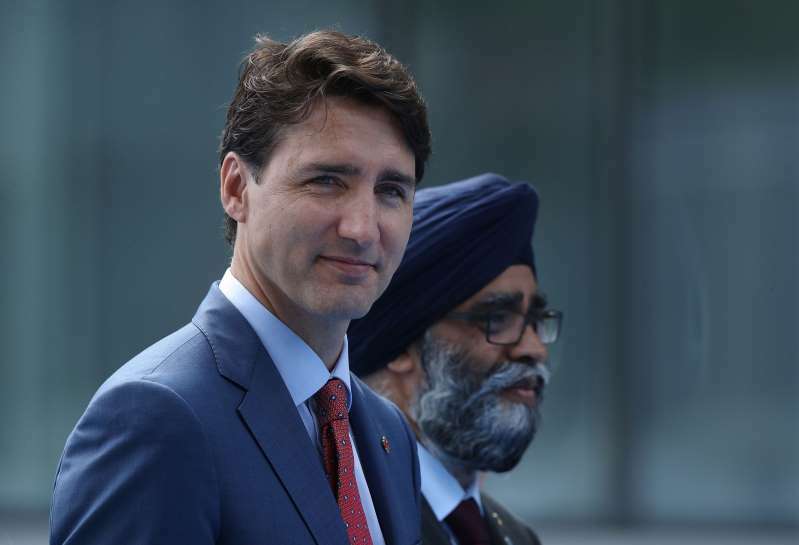 New figures show that Canadian military spending will be cut significantly, even as Canadian Prime Minister Justin Trudeau prepares to face U.S. President Donald Trump’s demands for higher NATO military spending at the alliance's summit in Brussels. [post_ads]According to the CBC, Canada will spend around 1.23 percent of its GDP on defense in 2018, down from 1.36 percent last year. This is far below the 2 percent target set for NATO members, which has been a particular bugbear for the American president. Canadian National Defence spokesman Daniel Le Bouthillier said the drop in investment was largely down to one-off payments. One was a retroactive pay increase for service members and the other was a $1.3 billion payment into the fund that pays out servicemember pensions. Meeting with NATO Secretary General Jens Stoltenberg Wednesday morning, Trump set the tone for what is expected to be one of the most acrimonious conferences in NATO’s 69-year history. The president repeatedly brought up one of his favorite NATO talking points, that the U.S. pays an “unfair” amount towards the defense of Europe. He warned Stoltenberg, “We’re not going to put up with it, we cant put up with it,” demanding that other states step up military spending. Few NATO nations have met the 2 percent pledge since the fall of the Soviet Union, and the alliance has now committed to meeting the target it will take time for them to deliver. Trump, meanwhile, said he expects the change "immediately." NATO leaders in Brussels this week will fear a repeat of Trump's G-7 performance. A fractured summit would play directly into the hands of Russian President Vladimir Putin, who Trump will meet next week in Helsinki, Finland.